Successfully Added HOMTOM HT20 Waterproof Smartphone - IP68, Android 6.0, 4G, Quad Core CPU, 720P Screen, Fingerprint Scanner (Black) to your Shopping Cart. The HOMTOM HT20 is a rugged phone with a difference, rather than coating the phone in a rubber exterior the designers at HOMTOM have made the phone more appealing to business users by omitting the usual rubber exterior associated with most tough waterproof phones. The result is an appealing, slim Smartphone that has an IP68 rating while remaining compact and most of all sturdy. This feat was achieved by the unique construction of the HT20. With the use of vacuum technology, the device has been hermetically sealed which not only boosts its waterproof and dustproof protection but allows for a more streamlined design. 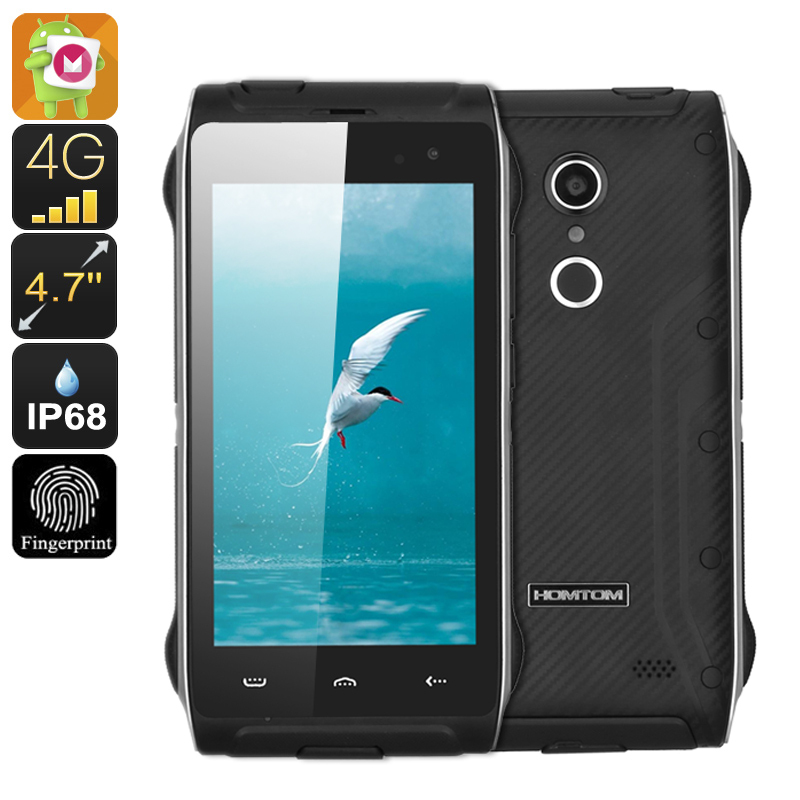 The result is a sublime looking phone with IP68 waterproof and dustproof protection. When it comes to hardware the HOMTOM HT20 is well equipped with an MTK6737 Quad Core CPU and 2GB of RAM which serves it well for all your everyday needs. Thanks to a Mali 720 GPU the phone can handle games and HD media without any hiccups and these all look great on the 4.7 inch 720P display. Running on Android 6.0 the phone has all the shortcuts that you need for easy intuitive use. Smart wake and gesture sensing allow for quick navigation and easier call controls making it a dream to use. With a fingerprint scanner, you no longer need to remember access codes or passwords and unlocking the phone can be done in a fraction of a second with just one hand. With twin 4G SIM card slots you gain access to high-speed data transfer so downloading or streaming media couldn't be easier.